The Cape of Good Hope, which is the southern extremity of Africa, lies in 34 degrees 29 minutes south latitude , and 81 degrees 23 minutes east longitude. It was discovered by the Portuguese in 1493, but they never made any settlement. The Dutch first visited it in 1600 and for many years afterwards touched at it in their visitors to and from the East Indies for refreshments. 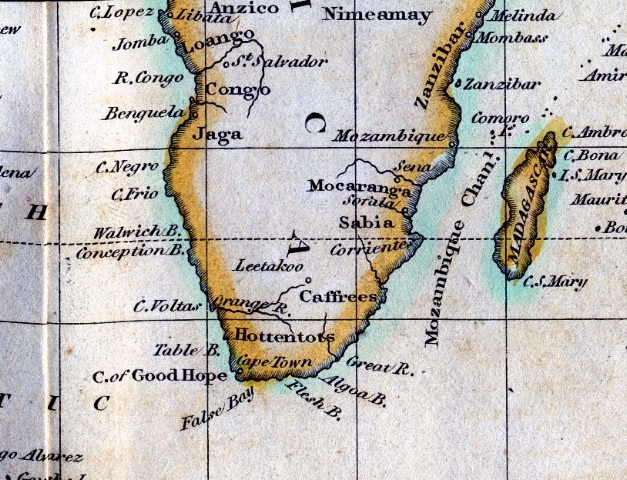 Table Bay and False Bay, one of which laves the northern and the other the southern shores of the isthmus, are usually resorted to by trading vessels. From September till May while the south-east winds are predominant the former affords the best shelter; but during the rest of the year, when the north and north-westerly winds are strongest, the preference is generally given by mariners to a cove, or indent, called Simon's Bay on the western shore of the latter. Though the Dutch were easily forced to abandon them ,when attacked by the British fleet in 1795, Mr Barrow affirms that all these bays, mountainous passes and, in short, every part of the colony might, if properly garrisoned, resist the most powerful attack that could in all probability be made against them. The batteries, lines and works have been lately repaired and improved by the British engineers; and the pass at the foot of Mount Muissemberg, which is the only path of communication between the Cape and Simon's Bay is so well secured by the recent construction on the heights that it may now be deemed impregnable. Use the "Show me" link to locate Cape of Good Hope on the map. You may need to scroll down to see Cape of Good Hope highlighted. "Yes, and you may guess who it is for. But" (in a deep tone) "it was not done for her. Miss Elliot, do you remember our walking together at Lyme, and grieving for him? I little thought then -- but no matter. This was drawn at the Cape. He met with a clever young German artist at the Cape, and in compliance with a promise to my poor sister, sat to him, and was bringing it home for her; And I have now the charge of getting it properly set for another! It was a commission to me! But who else was there to employ? I hope I can allow for him. I am not sorry, indeed, to make it over to another. He undertakes it" (looking towards Captain Wentworth); "he is writing about it now." And with a quivering lip he wound up the whole by adding, "Poor Fanny! she would not have forgotten him so soon!"